A dystopian novel set in a contemporary America which is no more. Broken into warring territories, its center has become a wasteland DMZ known as 'the Tropic of Kansas.' Two travelers appear in this arid American wilderness: Sig, the fugitive orphan of political dissidents, and his foster sister Tania, a government investigator whose search for Sig leads her into her own past—and towards an unexpected future. 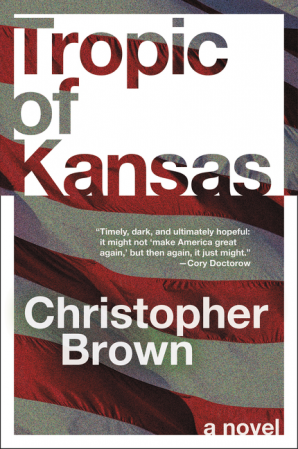 Christopher Brown’s Tropic of Kansas is very much the slap upside the head we need right now—a stark vision of a dystopian America that feels closer each day ... Brown’s dystopian view is rendered slightly more palatable by the action- and intrigue-packed middle section of the novel, as the rebellion races to stay one step ahead of the government. If the book wasn’t so provocative in its themes, we’d be talking about what an effective thriller it is. When it wants to be ... Brown’s vision of a deeply, deeply divided America under…let’s say controversial leadership has the ring of truth. Its stark vision won’t appeal to everyone (to put it mildly), but it’s a novel with a lot to say. This is science fiction doing the job science fiction does best: looking down a particular path, and suggesting we might want to think twice before heading that way. Tropic Of Kansas is like a modern dystopian buffet. It plays out in a world where all of our terrors have become manifest — climate change, wealth disparity, terrorism, an authoritarian government in power suppressing its own citizens, corporate control of everything from food to media. It is, in this particular moment in history, frighteningly prescient. It is the nightly news with the volume turned up to 11 ... From about the hundredth page forward, you know how it is all going to go down. But Brown, to his credit, uses the pages given to him to paint a frighteningly believable portrait of an American future that is closer than you want it to be. He sketches small-town fury and ultra-super-uber-right-wing nationalism in detail. Beyond the successful assassination of Ronald Reagan in 1981, it’s perhaps telling that Brown doesn’t go into detail as to how his fictional United States has fallen into such a derelict state, or how its citizens could possibly allow for a fascist president to take office (not once or twice, but three times) and fill the domestic skies with killer drones. In a way, we already know the answers … Brown is at his best describing the inner workings of the resistance: the way revolutionaries carve out an independent media network, making use of charmingly outdated technology to communicate and organize offline … Brown’s economical prose style ultimately fits this narrative, and the story essentially unfolds as a road novel...If Brown’s sentences seem restrained, even ugly at times, perhaps this is because there’s not much beauty to describe in this world. What did you think of Tropic of Kansas?